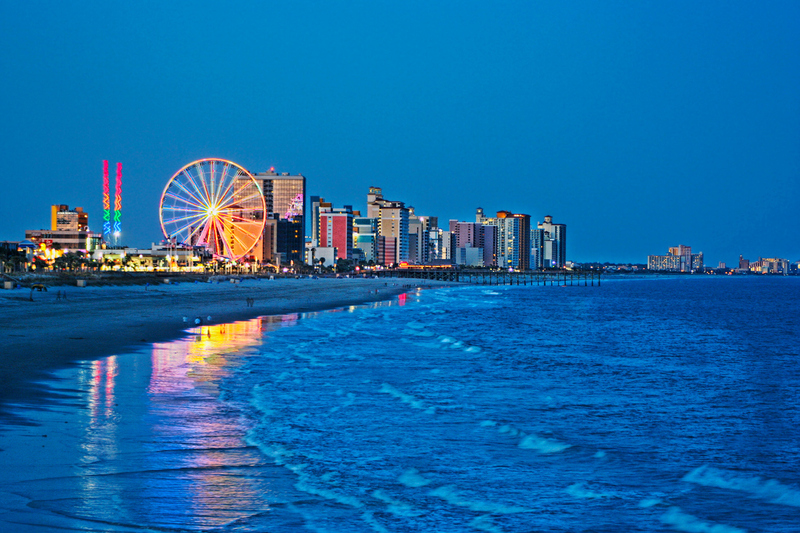 Myrtle Beach, South Carolina is not only a world-recognized travel destination, but also a premier location for business growth and development that is becoming increasingly recognized. The rapid growth of this metro is due to an increase in the retiree population & a rapidly growing business community including manufacturing and healthcare. According to the MBREDC, “From its humble roots as a small weekend getaway town for regional workers, Myrtle Beach has blossomed into a robust metropolitan area and become the business center of the Grand Strand. With its own baseball team, world renowned golf courses, and a thriving cultural scene, Myrtle Beach has everything you would expect from a big city, but with a small town price tag.” The city is expanding its reputation of being a vacation destination by pushing initiatives to focus non-seasonal industries such as aerospace, more manufacturing, and technology. As the baby boomer generation continues to age, they are moving to the North Myrtle Beach area for a relaxing retirement. The number of retirees is driving job gains in the healthcare industry, making the Myrtle Beach area an ideal place for healthcare professionals to seek job opportunities to care for the aging population. In 2016 USA Today recognized Myrtle Beach in the top 5 fastest growing US cities, behind three Texas cities and The Villages, FL. While 14.5% of the nation’s adults are senior citizens, 22.3% of Myrtle Beach’s population is 65 and older. Comprised of four separate communities, Cherry Grove, Ocean Drive, Crescent Beach, and Windy Hill, North Myrtle Beach is a progressive community. The area has been named one of Google’s 50 eCities, which recognized the growth of small businesses using the internet, and named it the strongest business community in the state. Horry County offers a modern infrastructure and is home to 25 international companies. The anchor industry, Leisure and Hospitality, comprises 25% of total employment with Healthcare burgeoning. It offers a diverse mix of sites and buildings, from Class A-certified industrial parks to business and commerce centers, for prime business locations. The Myrtle Beach Regional Economic Development (MBREDC) has worked to bring a number of new industries to the area including the corporate headquarters’ for the manufacturing firm BauschLinnemann and international customer service call center STARTEK. Through MBREDC’s “Building North Myrtle Beach” campaign and the strategic efforts of business leaders, North Myrtle Beach is on the front lines of stimulating new and existing business growth in Horry County. Myrtle Beach is currently ranked #15 on Forbes lost cost of doing business list. The city is also home to U.S. headquarters from companies such as Accent Manufacturing USA, Integra Fabrics, Canfor Southern Pine, as well as the manufacturing and distribution operations for Landusi Enterprises, the largest distributor of smoking pipes and tobacco in the United States. With an increase of healthcare activity, three outstanding hospital systems serve the Myrtle Beach region: Grand Strand Regional Medical Center, Tidelands Georgetown Memorial Hospital, and McLeod Loris Health. The Myrtle Beach area already offers a diverse mix of highly-skilled, reliable and experienced workers in a wide variety of fields. Myrtle Beach-Conway-North Myrtle Beach ranks in the Top 20 “Prime Workforce” Cities in 2016 by Area Development Magazine. The Grand Strand area offers unlimited options for recreational activities. Even with the push to broaden the Myrtle Beach area’s revenue sources, the popular vacation destination continues to offer career opportunities to those in the tourism industry. It Consists of over 60 miles of white sandy beaches of North Carolina and South Carolina, along with the intra-coastal waterway, nature preserves, and bike trails for any season of the year. There are great restaurants, shopping, over 100 golf courses, and entertainment in an easy reach. The Carolina Country Music Festival is new to Myrtle Beach, bringing in tourists for a weekend in June with top Country artists including Keith Urban, Tim Mcgraw, Rascal Flatts and many more. In addition to a music festival, the city is home to the Grand Strand’s largest concert venue, The House of Blues, which regularly host nationally known performers. The recent expansion of Myrtle Beach International Airport will connect customers, family, and friends to the world via air, and US 501 provides easy access to I-95 and beyond in under an hour. Since Myrtle Beach is historically a tourist area, commercial real estate developers have answered the demand for hotels and resorts, leaving multifamily in the dust to accommodate visitors for weekend getaways. This has mostly left multifamily construction out of the equation for years, with few even in the pipelines today according to Yardi Matrix. The city of North Myrtle Beach’s expansion plan has resulted in successful economic growth from non-tourist attractions by bringing different industries to the area. Forbes also recognized Myrtle Beach’s growth by ranking the city #16 for The Best Places for Business And Careers in 2015. Company migration to North Myrtle beach offers non seasonal/tourist opportunities for workers, which strengthens the demand for more long term housing options. Now the continuous stream of recent graduates entering the workforce from Coastal Carolina University and Horry Georgetown Technical College, won’t be as likely to leave in search for career opportunities. The already strong labor force continues to grow with young, knowledgeable employees who are ready to work and are in need affordable places to live. How can you make passive income from a multifamily asset in Myrtle Beach? Contacts us at info@maccvp.com or click the image below to visit our investor portal and make a free account!